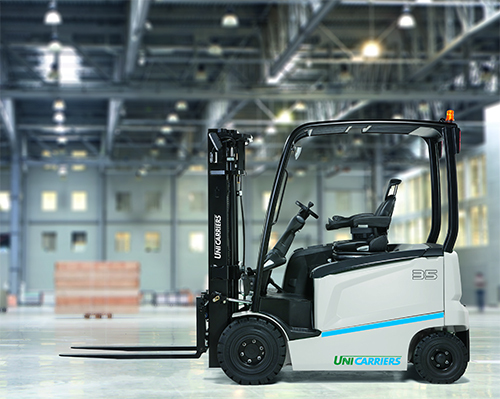 The UniCarriers MX is a robust, study four-wheel counterbalance which will get the job done every time. Offering effortless ease and total control, the truck's innovative features ensure safe, fast and efficient operation. The MX is exactly what a counterbalance truck should be - reliable, tough, and capable of handling anything you can throw at it. But it's also equipped with tools to make driving it as comfortable and easy as possible. For example, the Sensitive Drive System (SDS) smooths out starting and stopping movements, which adapts to the speed of the operator's foot movements and provides some extra agility. The fingertip controls are equally intuitive, allowing you to make fine movements with gentle presses. Even the truck's steering is built to increase ease of operation - a perfectly weighted wheel, in the optimum size, gives a light but firm feel to the driver, providing confidence and maneuverability at all times. The agile rear axle improves the truck's capabilities further - the back wheels can rotate through a full 100 degrees, meaning the truck can instantly and smoothly turn on the spot, with no initial 'push' needed. Features like the low-maintenance wet-disc brakes give you confidence that you can keep downtime to a minimum. Like all UniCarriers trucks, you'll see that reliability won't be an issue with this counterbalance. With load capacities from 2.5 - 3.5 tonnes and lift heights of up to 7 metres, the MX would be a trusty addition to any material handling operation. Are you interested in the UniCarriers MX? 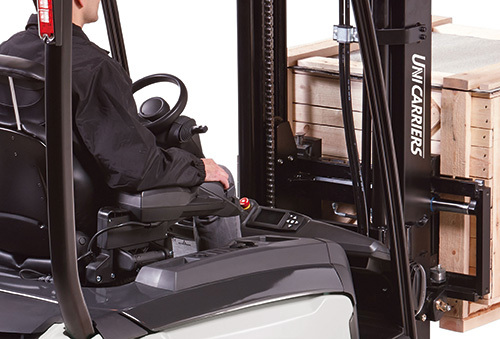 The MX's ultra-low dashboard gives the driver exceptional forward visibility, right through the mast to the fork tips. Naturally, all the essential controls are still in view and easily reached. The Sensitive Drive System (SDS), sensitive fingertip controls and perfectly engineered steering makes the MX a joy to drive. Operators will appreciate the comfort levels - and you'll appreciate the extra precision, productivity and safety which the truck allows.